My old cat tried Vidalta but eventually he wasn't eating, was lethargic, and lost large amounts of fur when I brushed him, which has never happened before. Maybe the tablets caused this. I am now giving him Felimazole and he is eating well, but still scratching alot. Side effects have to be watched out for, but balanced with the needs of the cat. It takes a while to get it right sometimes. I found the Vidalta tablets too big with a squarish edge, and they were not rounded and sugar-coated like Felimazole. The cat didn't like the after taste of Vidalta, and it was more difficult for him take to them due to the shape. 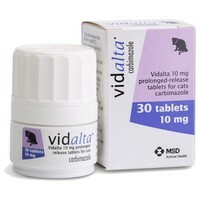 The vet said the one-a-day Vidalta makes it easier, but I am now giving the cat 2 Felimazole, one morning, one evening. His T4 is 28 which is good, and no hassle with tablet-giving. Prescribed by our vet for hyperthyroid, these tablets have made such a difference to our cat. He is much calmer and thyroid levels are kept well under control.